Sniff is a close relative of both All Fives and Muggins, but it is a distinct game. It is considered to be one of the best domino games, especially for two players. If there are four players, then Sniff may be played as a partnership game. The remainder of the tiles make up the boneyard (or "stock"), and are held in or reserve to be drawn upon at need. The first player places the first domino. The first tile down can be of any value, and need not be a double. However, the first double played, whether it is the initial tile or not, can be played off of on all four edges. This initial double is known as the sniff. All subsequent doubles can only connect on two edges. Play proceeds to the left (clockwise). Each player adds a domino to an open end of the layout, if he can. If a player is unable to make a move, he must draw dominoes from the boneyard, but no more that two at a time. If there are only two players, two dominoes must remain in the boneyard; if there are more than two players, all tiles may be drawn from the boneyard. If there are no dominoes left, then the player must pass. The object of the game is to make to make the open ends of the layout add up to 5 or a multiple of five (5, 10, 15, 20, etc.). The player who makes such a score receives that number of points. At any time there may be 2, 3, or 4 open ends. When a double is first played, all of its dots count toward the total. If the first tile placed is a 5-5, then the player scores a 10. At this point all sides of the 5-5 are available for play. If the second tile placed is a 5-0, then the player scores a 10. At this point three sides of the 5-5 are available for play, as well as the blank. If a 3-5 is played on, the 5-5, the total is 13 (5 + 5 + 3 + 0), so that move scores no points. If the next move is a 0-2, then the total is 15 (5 + 5 + 3 + 2), so the player scores 15 points. The top and bottom of the initial 5-5 are still available for play, as is the 3 and 2. Four moves later, a 5-4 has been placed atop the 5-5, a 2-2 has been placed off the 0-2, a 2-5 has been connected to the 2-2, and a 3-3 has been connected to the 3-5. The total is 20 (5 + 4 + 3 + 3 + 5), so the player scores 20 points. There are now 4 open ends: the bottom of the initial 5-5, the 3-3, the 4, and the 5 on the right. Note that the top and bottom of the 2-2 are not open. A hand ends either when a player plays all his tiles, or when a game is blocked, at which time the lightest hand wins total of his opponents points (minus any points in hs own hand), rounded to the nearest 5, and divided by 5. For example, if the winning player has 3 points in his hand, and his three opponents have 5, 11, and 13, then the total difference is 26 (5 + 11 + 13 - 3). This is rounded down to 25 and divided by 5. Thus, 5 additional points are added to the winner's total. All players retain the points that they have attained during gameplay, but only the winner gets the bonus points at the end of a hand. A game is generally played to 100, 200, or whatever is agree upon before the game begins. A Cribbage board can also make a handy scorekeeping device. If a Cribbage board is used, the point totals during play (5, 10, 15, etc.) are divided by 5, yielding 1, 2, 3, etc. End-of-hand bonus points are still given full value (in which case they become even more important). Games played using a Cribbage board are typically played to a score of 61. The ends of the initial double (the spinner) do not count towards the point total once both sides of the tile have been played. If using this rule, then the pips on the "5-5" in examples "c" and "d" in the above diagram are not included in the total points. Pagat.com describes Sniff with unlimited draws. 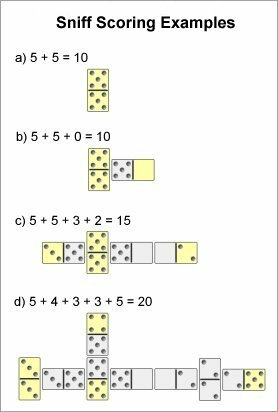 If a double is player in-line, rather than crosswise, then only one of the numbers counts toward the total.